Last night at the 4th Annual CIMA (Chicago Interactive Marketing Association) Holiday Party, Resolution Media was presented with the award for “Best Search Campaign” for our work on the launch of a new Gatorade product, G2. 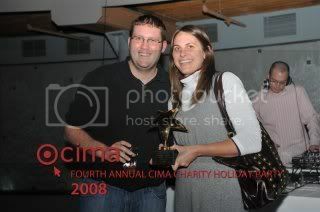 This was the 2nd Annual CIMA STAR Awards and Resolution Media is honored to be recognized. The launch of G2 was definitely a group effort by several agencies within the Omnicom family (OMD, Element 79, Fleishman Hillard, TPN) and RM would also like to recognize them for all their work that led up to the launch’s success. Kudos to the RM team that managed the search program for the G2 launch: Stacie Susens, Nathan Janitz, Chris Kanellakes, Tomas Muriel, Haley Fierstein & Jackie Kerby. Way to go guys! Great job! Congrats! Do you have a case study for this campaign? Please contact me directly with your request at BCarpenter@ResolutionMedia.com.